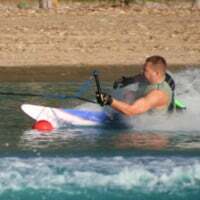 I did not ski it, but a good friend of mine Chad Guzman did.. here is a vid of his slalom run. He can consistently perform better than I.
Wow that is impressive. I think he runs deeper than a lot of us. Very cool. @usaski1‌ what is the disabled world record for that style of skiing? I think its [email protected] (32 mph) Chad has the world record.. and he's had it forever... (10+ years) Nothing but respect for him. I showed that to my kids and they thought it was really cool. @usaski1‌ Cool video! Thanks for sharing Mark. Glad you and Holly made it out, sorry I didn't get to visit with you much, I was a little busy!